There’s no better time to embrace nature than in the fall, the season of transformation. Over the past few decades, our forests have come under major threat due to a number of human-induced disturbances. Trees play important roles for not just our ecosystems but for our community as well. 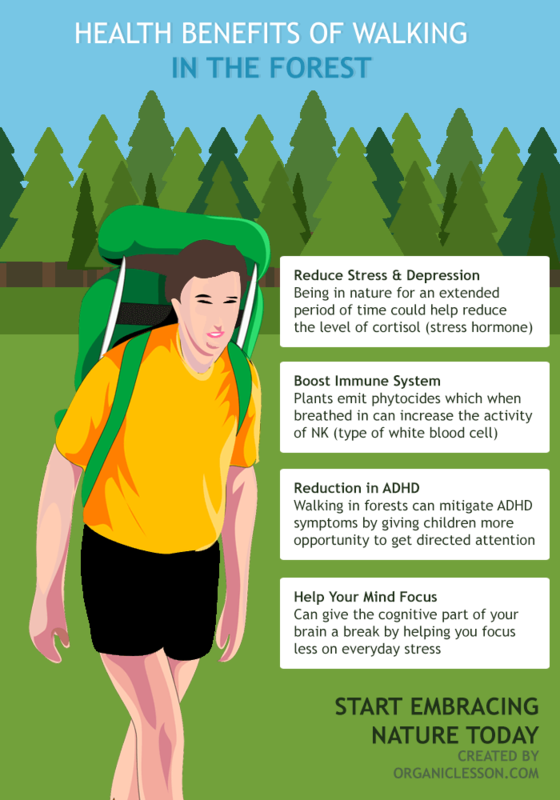 Turns out there are many health benefits from wandering around the woods. The following infographic, created by Organic Lesson, highlights four health benefits that have been suggested by past research studies. From reducing stress to boosting our immune systems, check out the infographic to learn more. According to a study by researchers at the University of Illinois at Urbana-Champaign, viewing nature could help reduce the level of stress hormone in the body. Imagine yourself in the woods where your mind is free of daily stress and you have so many beautiful things to gaze at while you walk by trees, rivers, and open sky. The best part is that there are many outdoor activities you could do outside of walking to gain the same benefits. Search online for local outdoor yoga classes or maybe you want to try something creative like a photography class. There’s something for everybody! Plants emit a substance called Phytocide, which helps them against bug attacks and diseases. Studies have found that Phytocides are beneficial for human beings as well. When we breathe in the chemical substance, our bodies respond by increasing the production of white blood cells that protect us from infection and disease. The same studies have suggested that this plant-based substance could also help with reducing the risk of cancer. Another study found that outdoor activities could also help mitigate ADHD symptoms. For example, a study at the University of Illinois found that exposure to everyday green spaces could potentially help with treating ADHD. The study found that engaging in such activities could help replenish a child’s “directed attention”. As you can see, there are many benefits that we gain from embracing nature. We have to do more to protect our valuable trees, and there’s no better way to do that than educating yourself and the people around you on the benefits that forests provide. Start planning for an outdoor trip today and experience all that nature has to offer! Sam Choan is an organic gardening enthusiast. His blog Organic Lesson shares his experiences on topics like gardening, sustainability, and going green. Sam is an advocate of environmental conservation and uses his blog to promote such activities.